The significance of debottlenecking the air compressor in ammonia and nitric acid production. One thing is certain about the fertilizer market: demand for all chemical fertilizers continues to grow. The worldwide population is increasing – most notably in emerging economies – and with that, there is a corresponding need for more and more agriculturally produced foodstuffs. Of course a variety of factors prevents the growth in available food (primarily estimated to be cereal supplies) from meeting the needs of a growing population: the ability of suppliers to get food to the areas most in need, pricing above market and the ability of the world agriculture industry to keep pace. Sadly, in much of the world – and especially the developing world – famine is still a pressing humanitarian concern. Of concern to the fertilizer industry is the fact that demand continues to grow. The Food and Agriculture Organization (FAO) of the UN produced a report in 2014 that estimated growth in fertilizer, including nitrogen, phosphate and potash, to be between 1 and 2% per year through 2018. The report further states that demand for nitrogen fertilizer will increase by over 6 million short t between 2014 and 2018, with the primary increases in demand being nearly 60% in Asia and over 20% in the Americas. As is well known to readers, technology innovations, such as the Haber-Bosch process (and others), have been critical in helping world agriculture keep pace with tremendous growth in population. To be certain, without the chemical fertilizer industry, the current issues with famine would be far more widespread; indeed, a significant percentage of the world population might have been eradicated. Despite the strong demand for chemical fertilizers, various factors affect the ability of the industry to meet demand, and for companies to be financially successful. Chief among these is the fluctuating commodity pricing for nitrogen, phosphate and potash. But others include distance of low-cost producers from target demand markets (which can influence shipping costs) and the cost for feedstocks, in particular natural gas. The ‘fertilizer miracle’ that has occurred over the past few years in the US resulted from low-cost natural gas combined with a recovering economy spurring producers to onshore production they had previously sent elsewhere. When plants have been operating for a long period of time, they can develop performance bottlenecks, including reduced flow rate and reduced efficiency in reformers and other critical components. Plant expansions and increases in capacity can only accomplish so much – and, of course it is only possible to add so much capacity – before debottlenecking strategies become of prime importance. There are a number of solutions to this problem – that is, in addition to locating plants in parts of the world that have cooler climates. Since the latter is not always practical, more pragmatic strategies include focusing on other plant bottlenecks in order to compensate for air limitation, refurbishing or replacing the air compressor and others. One increasingly popular debottlenecking strategy is suction air chilling. Using an advanced air cooling machine that is placed between the air compressor’s inlet/filtration and the outflow to the compressor itself, suction air chilling cools the air and increases the mass flow, thereby increasing production at a nominal cost. TradeMark Nitrogen Corp., based in Tampa, Florida, is a wholesale manufacturer, seller and distributor of bulk commodities for industrial and agricultural customers throughout the US. The company has a strong commitment to safety and reliability, and recently sought to improve the performance of its nitric acid plant. TradeMark approached Everest Sciences in 2015 about ways it could debottleneck its ammonia production using suction air chilling. 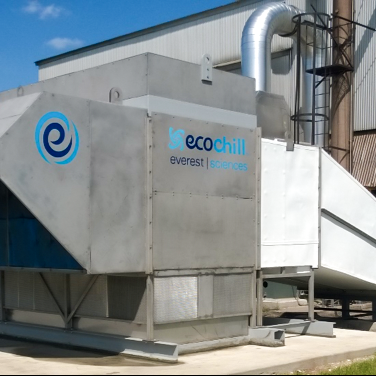 After a detailed design review, the company selected ECOChill® hybrid system, Everest Sciences’ patented hybrid indirect evaporative chilling system, for production enhancement. The TradeMark nitric acid plant was debottlenecked by chilling the inlet to the plant’s suction air compressor. The hybrid system was installed due to its low operating costs and modular design, minimizing the site installation time and cost. Investing in debottlenecking existing high value assets, such as nitric acid and ammonia plants, allows asset owners to dramatically improve their profitability quickly. The TradeMark equipment was delivered in 20 weeks and added incremental production in 26 weeks. For all locations in the Americas, suction air chilling will add incremental production. This incremental full year production ranges from 4% in the Midwest to almost 10% in the south, and the site equipment can impact this range. A key value added is the consistent production throughout the year (Figure 2). For the TradeMark facility, the annual full year production increase is expected to be over 7%. Since the installation earlier this year, the production improvement is tracking as expected. For TradeMark’s production enhancement project, the modular ECOChill solution was factory packaged and tested, then delivered to the site in Tampa for installation in January 2016 and started up in March 2016. This particular solution is the first to use Everest Sciences’ design improvements, which allow the same customer-committed air flow in a 40% smaller footprint. A key benefit of ECOChill is the automated and reliable operations of the chilling solution, providing a consistent inlet temperature and thus system production increase even as the ambient temperature varies. For an ammonia producer, such as TradeMark, the important metric of success for a project similar to this is demonstrable increases in production. The ECOChill system was installed in late Winter, so full Summer operation has not been assessed. 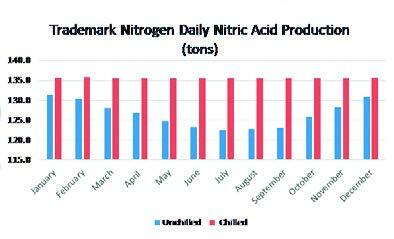 But even with warm weather, ammonia production is tracking an increase versus unchilled production. As warmer Spring and Summer months bring higher temperatures, these increases are expected to be even higher. 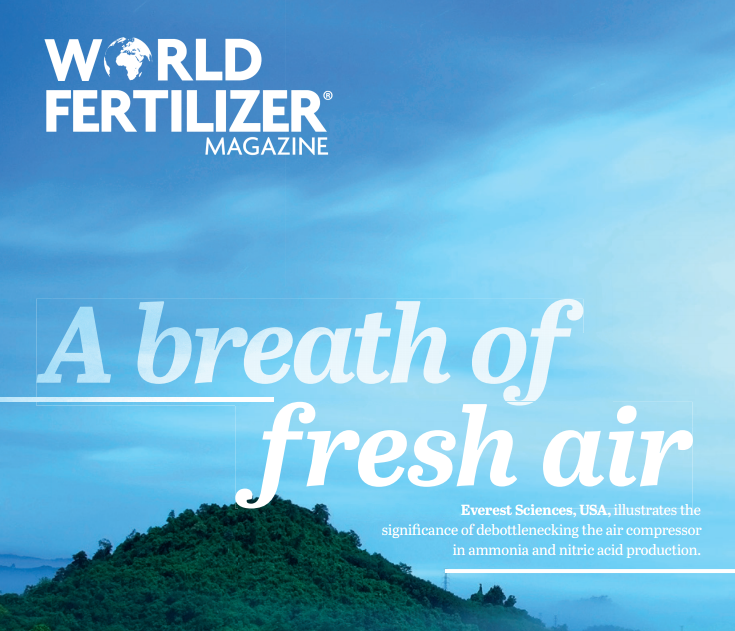 As has been seen, world population growth has led to a strong demand for chemical fertilizer, creating great opportunities for ammonia and nitric acid producers. At the same time, smart plant management and engineering teams constantly look for ways to increase production cost-effectively. This is true even when commodity pricing is challenging, as it is in the current climate.